StattLab has moved homes, and the Analog Photography Berlin workshops have moved with it. Yes, it’s sad but true that StattBad Wedding has come to an end. 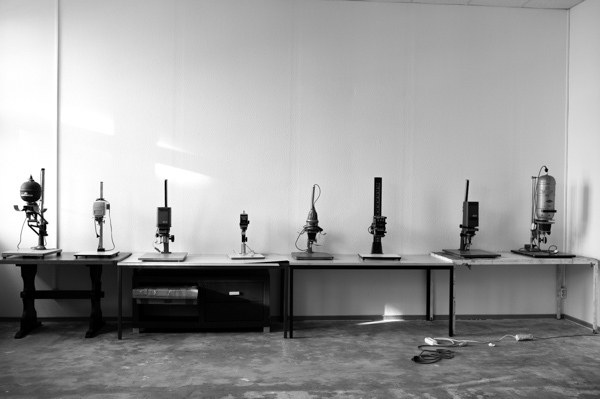 The workshops for analog photography and silkscreen – StattLab – is back and stronger than ever. The new lab is still in Berlin-Wedding, this time at Drontheimer Str. 34. We expect to be here for a long time this time! And so I am happy to announce the first round of workshops taking place at StattLab. The 2-part Introduction to Analog Photography workshop will be held tomorrow and next tuesday, June 23rd and 30th from 18:00-23:00. You just need to shoot a roll of black and white film before the workshop. Cost is 50€ per person for both sessions together. More info here. If that is too short notice for you, there will be a second course on July 21st and 28th, also Tuesdays at 18:00, 50€ per person. This coming weekend I will also be teaching an introduction to studio portrait lighting, also at StattLab. The course is is Saturday and Sunday June 27th and 28th, from 10:00-19:00. We will start with the basics: Why do we use artificial light? And then roll through the various options, how to set up camera flashes as strobes, which modifiers we use, how to meter light, get various effects. We’ll work through gelling (color / color temperature), mixed lighting and multiple light setups. You won’t become a master in two days, but it’s a great way to dive in. There are still 2 spaces available. Price is 150€ for the whole weekend. An multi-week intermediate course in analog photography will be coming in August or September – if you are interested, send a smoke signal. This entry was posted in Uncategorized on June 22, 2015 by Analog Photography Berlin.